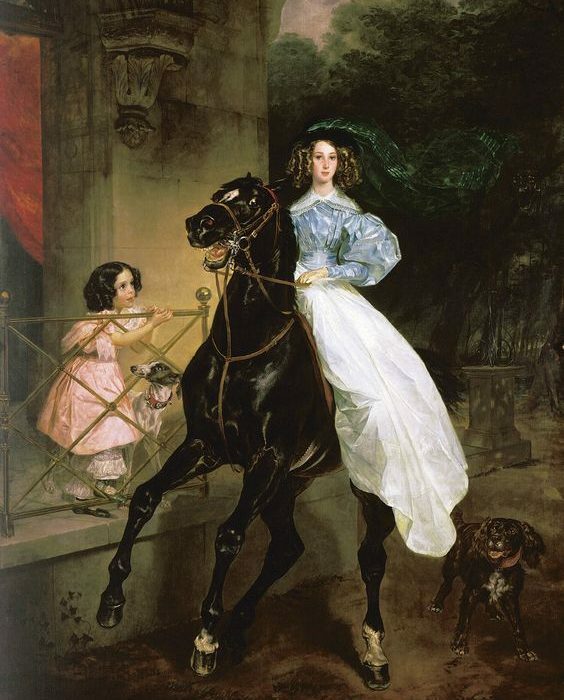 Karl Pavlovich Bryullov, known by his friends as “Karl the Great” or the “Tzar of Painting,” was the first Russian painter of international standing. He is often regarded as the founder of Russian Romanticism. Born of French parents (descended from the Huguenots) in St. Petersburg, he was named Charles Bruleau until 1822. His great grandfather, grandfather, father and two elder brothers, Fyodor and Aleksandr, were all artists. Bryullov’s first teacher of painting was his father who was a sculptor and ornamentalist and a member of the Academy of Arts in St. Petersburg, where all his sons received their education. 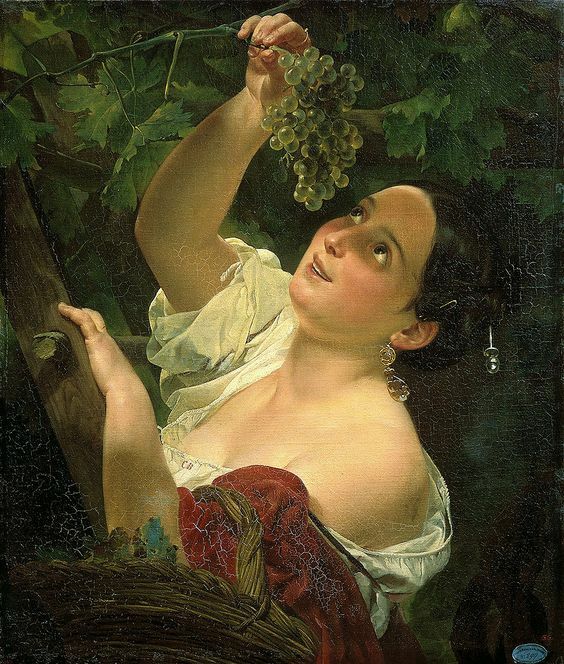 From 1809 – 1821 Bryullov studied at the Academy under the artists Andrey Ivanov, Aleksey Yegorov and Vasily Shebuev. With his talent and heritage Karl advanced much faster than his fellow students. At the time, educa-tion at the Academy was based on the principles of Classicism, and Bryullov’s early works reflect this clearly. In spite of stylistic constraints, art education in Russia was superb in quality. What mat-tered most was to teach the artist to think historically, philosophically, ethically and morally. Draw-ing – the main subject of the Academy’s curriculum – was Bryullov’s specialty. When he painted something requiring encyclopedic knowledge and compositional skill, he worked playfully and with ease. 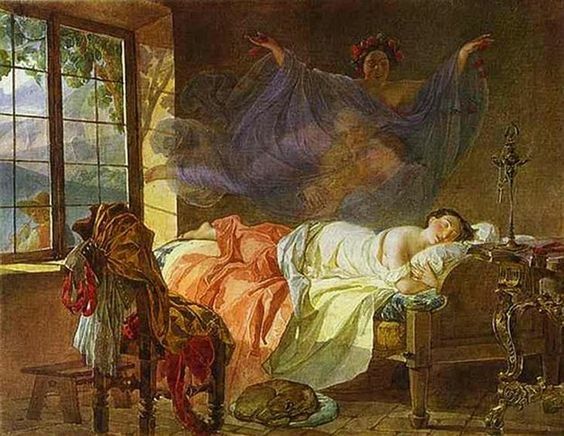 However, the political and social changes that the French Revolution and Napoleonic Wars had perpetrated in Europe were beginning to manifest themselves in fashions and artistic tastes forming the Romantic trend in both fine arts and literature in Russia as well. 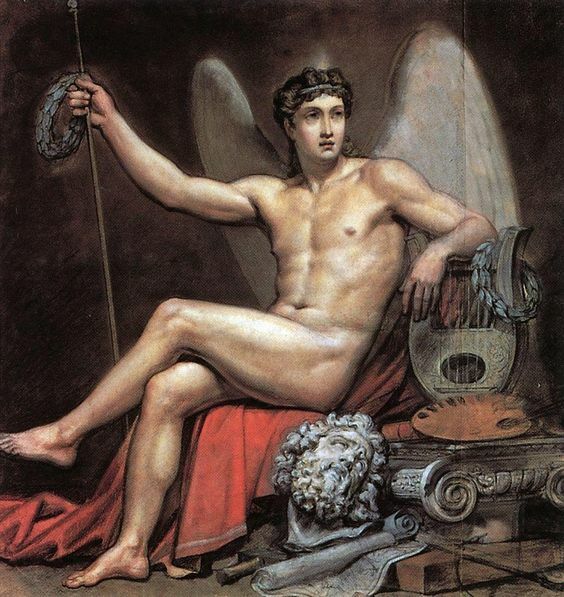 One of Bryullov’s early paintings, Narcissus (1819), while composed in accordance with Classical principles in every re-gard, was unorthodox in its finishing because the painter sought inspiration for the work in nature – something that would become characteristic of the Romantics. However, it would be some time before Bryullov would break from the constraints of Classicism completely. His graduation work Three Angels Appear to Abraham by the Oaks of Mamre, while completed with technical brilliance, is otherwise a model work of a model student. Bryullov re-ceived a gold medal for it and a scholarship from the newly created Society for the Promotion of Artists, which helped artist to travel abroad to Germany and Italy for three-year periods (for Bryullov it would be 15). During the short period he worked in Russia independently (1821 – 1822), it is easy to observe his shift from Classicism to Romanticism. The artist focused primarily on the portrait genre, which was frowned upon in the Academy as it was considered low profile, but which was central to the Ro-mantic idealization of the human figure. 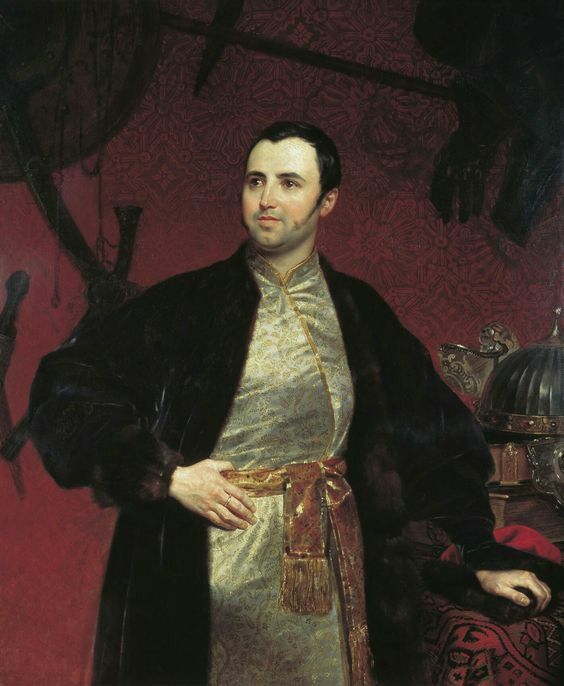 His works of this period include the Secretary of State Pyotr Kikin (Bryullov’s patron at the time) with his wife and daughter and of the actor Aleksandr Ramazanov. In 1822, Karl and his brother Aleksandr, an architect, left for Europe. True to his alma mater, young Bryullov frowned upon anything that went against academic ideals, expressing this disdain in letters that he wrote home. The two artists traveled through Germany, Austria, Venice and Florence, even-tually arriving in Rome. Like many of his contemporaries, Bryullov found the city irresistible; he was captivated by the way of life and customs of the Italians, their humor and lyricism. Like many foreigners working in Italy, he made copies of Raphael’s Vatican murals, painted por-traits of distinguished visitors and idealized figures of young Italian women representing the times of day – cheerful, harmonious works that destroyed the strict academic canons of beauty. He also performed many watercolor and pencil studies including ruins or other picturesque landscape mo-tifs. He created a series of genre scenes of everyday Roman life. 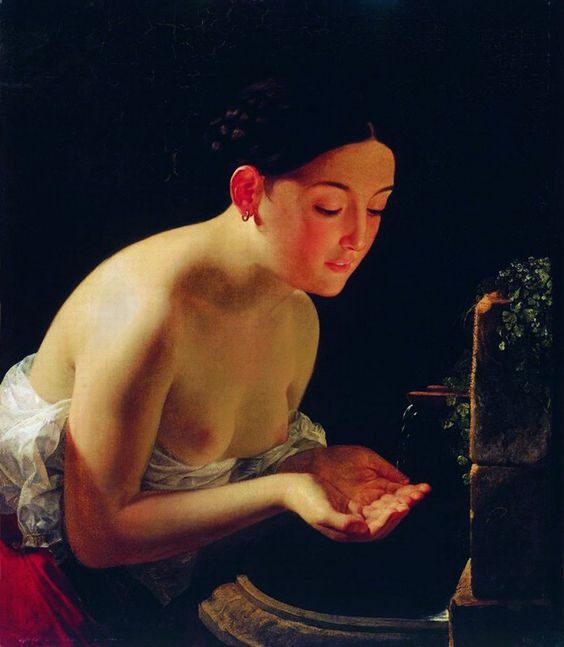 The most important of these was Italian Midday (1827), in which the artist achieved naturalness in the image of a naked body and il-lumination effects. The Society for the Promotion of Artists required that all its pensioners create at least one large his-torical painting. In 1827, Bryullov visited the excavation site of Pompeii, a town in southern Italy destroyed and buried under a layer of ash following the eruption of Mount Vesuvius on 24 August 79 AD. Bryullov was greatly impressed when he saw the ancient town, perfectly preserved under the ash. The cataclysm had been so sudden that life had simply stopped, as if frozen in time. Six years passed between the conception of the idea and its materialization on a huge epic 24 square meter (456.5cm x 651cm) canvass known as The Last Day of Pompeii (1830 – 1833). Bryullov obtained financial backing from the wealthy Russian art collector Count Anatoly Demidov and spent three years (1830 – 1833) on the actual painting while visitors flocked to his studio to see the work in progress. After the first sketches had been done, he began studying the artifacts found in excavations and historical documents, such as the letters of Pliny the Younger, who was an eyewit-ness to the event (it is believed that Pliny is portrayed as the young man persuading his mother to come with him in the right part of the picture). After much historical and archeological research, Bryullov chose an existing location in Pompeii as the setting for his painting. The painting shows the ancient catastrophe, the eruption of Vesuvius, which involved the destruc-tion of Herculaneum and Pompeii in 79 AD. After the buried cities were discovered, this event be-came a popular motif in the art and culture of the 18th and 19th centuries. In his work, Bryullov discerned a profound feature, consonant with romanticism – the idea of the global end of civiliza-tion. Rich and splendid, a civilization dies dramatically: palaces crumble, statutes fall, the sky with horrible black clouds catches fire, clods mix into total black rain. At the horrible moment of disas-ter, people with faces and postures, beautiful in their antique way, are full of goodness and self-sacrifice. On the other hand, Bryullov’s painting can be interpreted as a moral and sublime allegory of Destruction of the Impure Town, which symbolically meant the punishment of sinful souls en-meshed in vile passions and a Divine warning for human civilization. Nearly all the figures and de-tails depicted in Bryullov’s painting can be read through esoteric metaphors familiar to pious Rus-sian audiences of the time, especially the Freemasons (Bryullov belonged to this category). Bryullov’s creation caused quite a stir. According to his friend and apprentice Grigory Gagarin, the son of the Russian ambassador to Rome, “It can be said that the success of the painting The Last Days of Pompeii is unprecedented in the life of artists. The Italian cities, where the picture has been displayed, gave the artist red-carpet receptions. Everywhere he was received with honor as a trium-phant genius, understood and appreciated by all.” Local critics compared Bryullov to the greatest artists of the past, such as Rubens, Rembrandt and Van Dyke. The work was also exhibited in the Louvre, Paris. Bryullov won awards at the Paris Salon of 1834 at the Louvre and he received hon-orary memberships in the Academies of Bologna, Florence, Milan, and Parma; in Russia, Bryullov was acclaimed the greatest master of his time. The canvas was admired by French writer Stendhal. Danish sculptor Bertel Torvaldsen claimed that none of the painters living in Rome were able to even arrange such a work. Edward George Bulwer Lytton (a British novelist, poet, playwright, and politician) was inspired by it to write his popular novel The Last Days of Pompeii (1834) and Sir Walter Scott stood in the studio for a whole hour, after which he said “rather than a picture, it’s a whole epopee” and even reportedly knelt mesmerized in front of the canvas. A monumental tour-de-force of drama, vivid color and twisting and tormented bodies, the enormous canvas captures the emotional intensity of the moment with such power that Bryullov has been known ever since as the first painter of Russian Romanticism, the Pushkin of the visual arts. The painting met all the demands of Romanticism. In fact, The Last Day of Pompeii exemplifies many features of romanticism in Russian art, including emotionality, realism tempered with idealism, in-creased interest in nature and a zealous fondness of historical subjects. Dramatic to an extreme – in its catastrophic subject, sweeping, diagonal composition, the shock of brilliant flashes of lightning and volcanic explosion on the right against the black deluge of ash at the left and the pathetic con-trast of physically ideal human bodies undergoing painful contortions – it was also thoroughly re-searched with a wealth of archaeological detail and references to ancient texts and quotations of visual motifs from Michelangelo’s Deluge and Raphael’s Fire in the Borgo. 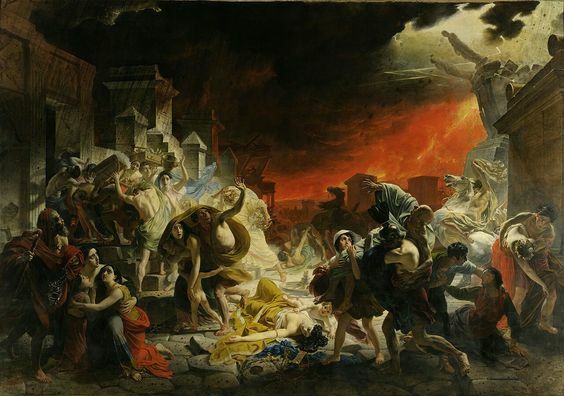 It is also speculated that Delfine Gay’s poem The Last Day of Pompeii (published in Russia in 1831) and Giovanni Pacini’s opera “L’Ultimo Giorno di Pompei” (premiered in Naples in 1825) had an impact on the painting. 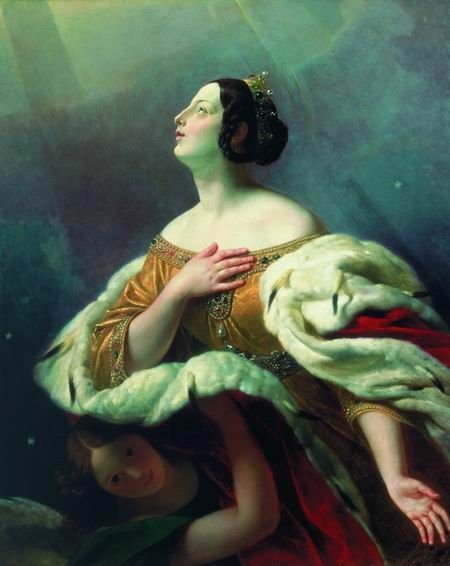 Although by today’s standards we may find the painting somewhat theatrical and lacking in life, it is certainly an important achievement for an artist of the early 19th century and a significant step in the development of historical painting in Russia. 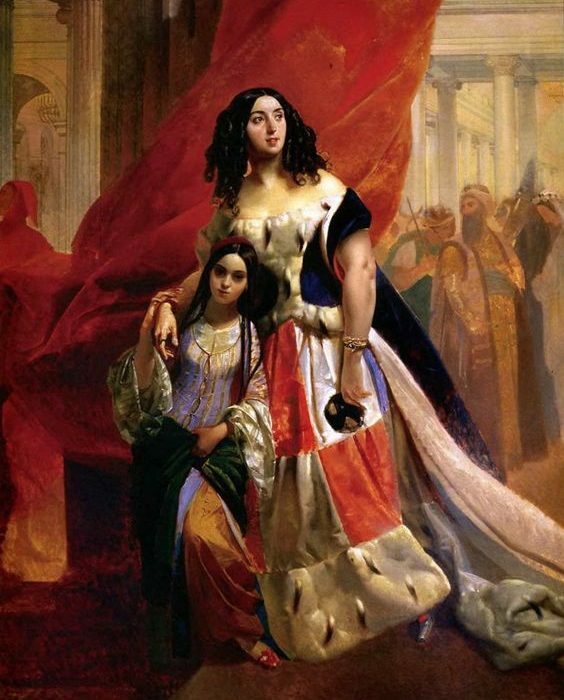 In Italy Bryullov also created over 120 portraits in various techniques. 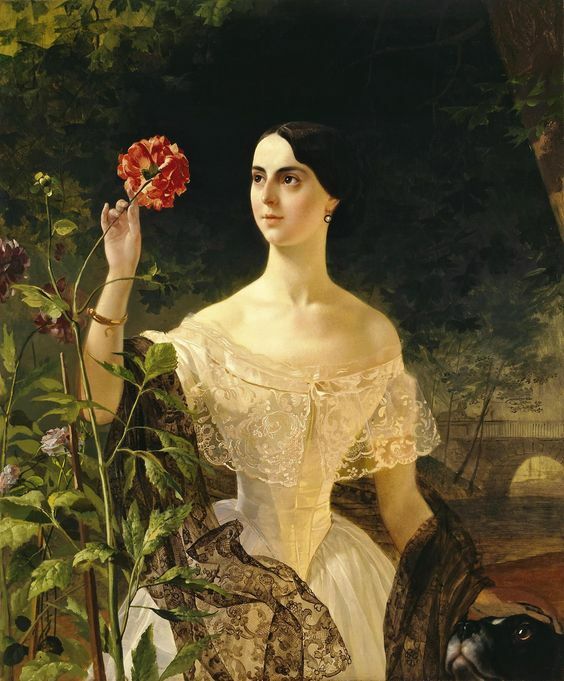 Among them are portraits of the Russian aristocracy residing in Italy, as well as painters, sculptors and writers and Italian statesmen and artists. 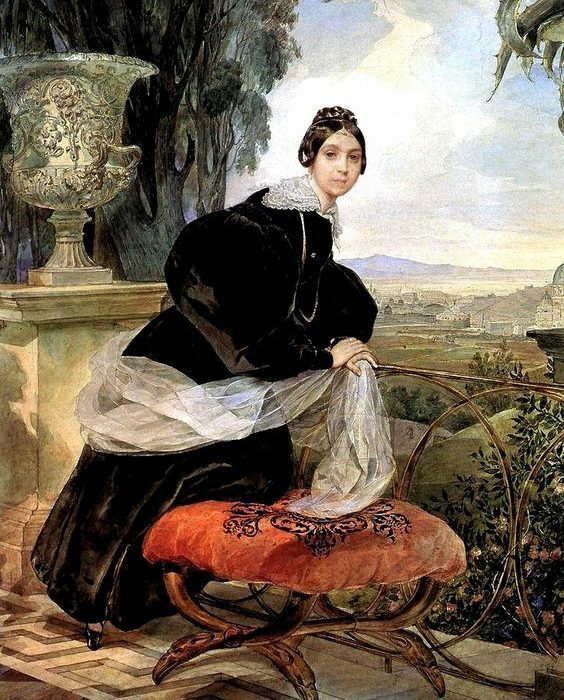 Among the most notable are portraits of Grand Duchess Elena Pavlovna, Prince Gavriil Gagarin, Princess Zinaida Volkonskaya, Bryulov’s brother Aleksandr, the Italian singers Juditta Pasta and Fanny Persiani-Tacinardi and many others. 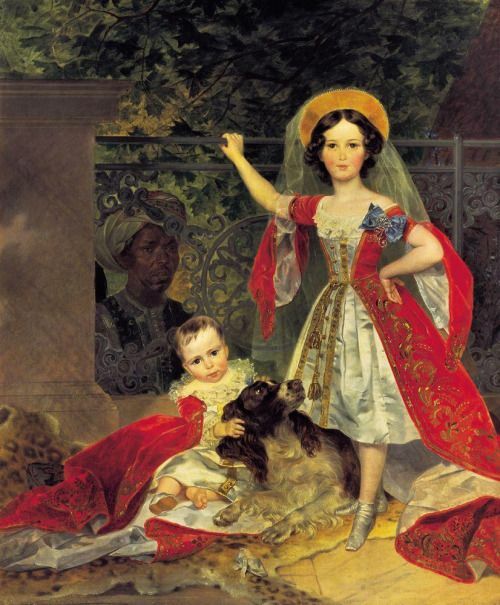 But his richest and definitely most beloved portrait of the Italian period is of Countess Julia Samoilova (1803 – 1875), the beautiful, charming and scandalous “Russian Lady of Milan” with her foster-daughter and a black servant (painted in 1832-1834). 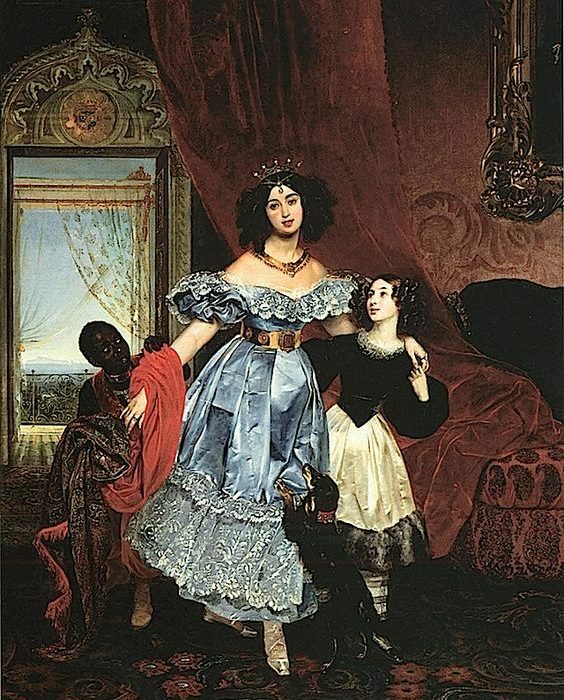 Over life-size (2.7m x 1.8m), it is sim-ply composed: the young Samoilova dressed in the height of Parisian fashion strides towards the viewer accompanied by her Italian foster-daughter Giovanina, a family servant and a pet dog. 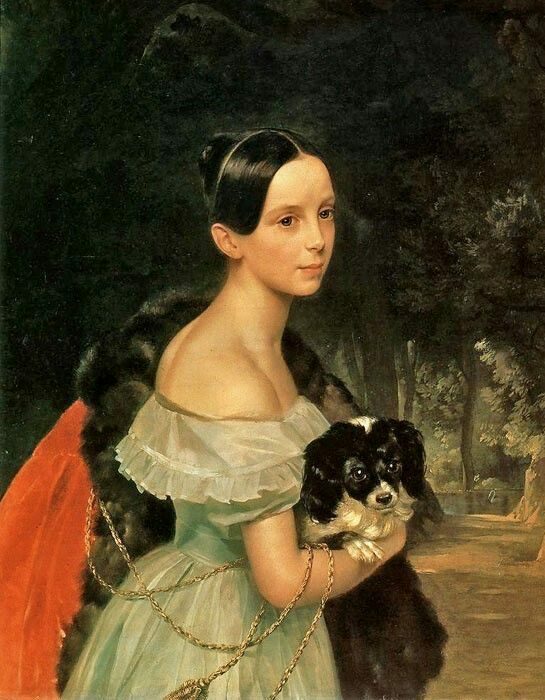 Painted in 1832 – 1834, it is generally perceived as a traditional early 19th century parade portrait, an image of domestic bliss, and typical of the artist’s many decorative society portraits. 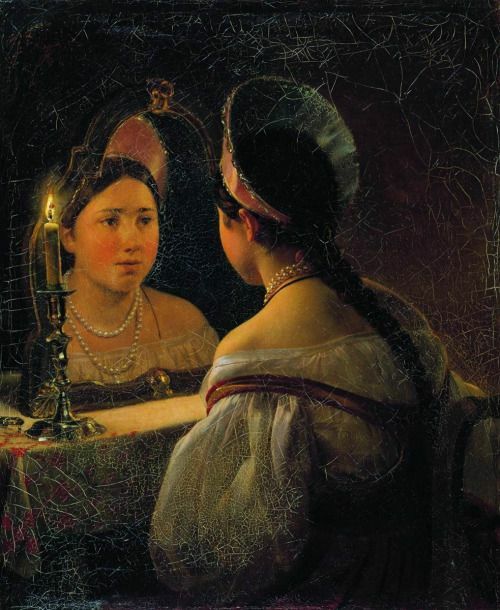 However, the painting lends itself to another reading as a sophisticated depiction of a passionate but illicit ro-mance between the artist and his sitter, a sort of a lasting love letter from the artist to his “goddess” and a personal remembrance of an intimate relationship between the two Russian expatriates and of their time together in Italy. The fascinating lady was surrounded by artists. As a free bird she traveled all over Europe. Life and merry-making bustled around her. 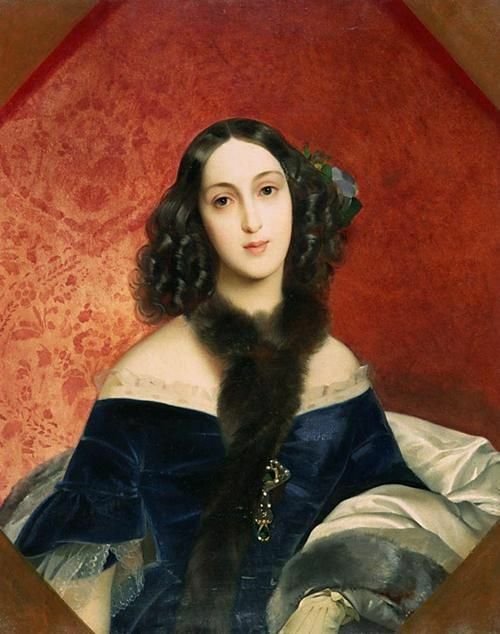 The countess was passionately infatuated with Bryullov. She was close to him in spirit, not to mention that she personified the type of female beauty that the artist adored. The two were unable to make their relationship official, as Samoilova was married, though she and her husband had separated (divorce was not allowed under the laws of the Orthodox Church). 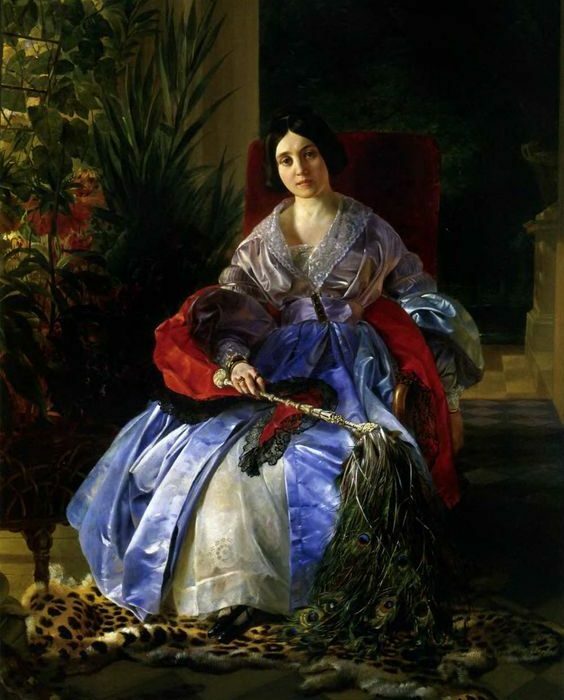 Samoilova’s lavish way of life, however, led to her financial ruin and she was forced to sell works of art to support herself in her later years. But she never sold Bryullov’s portrait, keeping it until her death. In 1834 The Last Day of Pompeii was displayed in the hall of the Academy of Arts in St. Petersburg and became a notable social event. 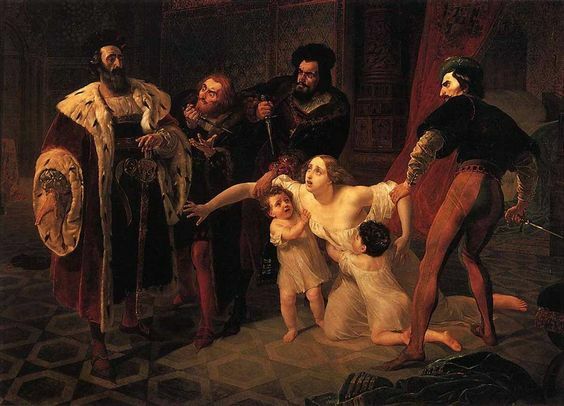 Upon his return to Russia in 1835, Bryullov was welcomed back as a hero and even granted an audience with Emperor Nicholas I. In the Academy, there was a re-splendent fiesta by the picture. The crowd was jubilant, all eager to become Bryullov’s pupils. They put a wreath of laurels on Bryullov’s head, but he took it off and crowned his teacher Andrei Ivanov with it. Russian critics lavished the Last Day of Pompeii with praise and Aleksandr Pushkin was in-spired to write a poem on the subject. 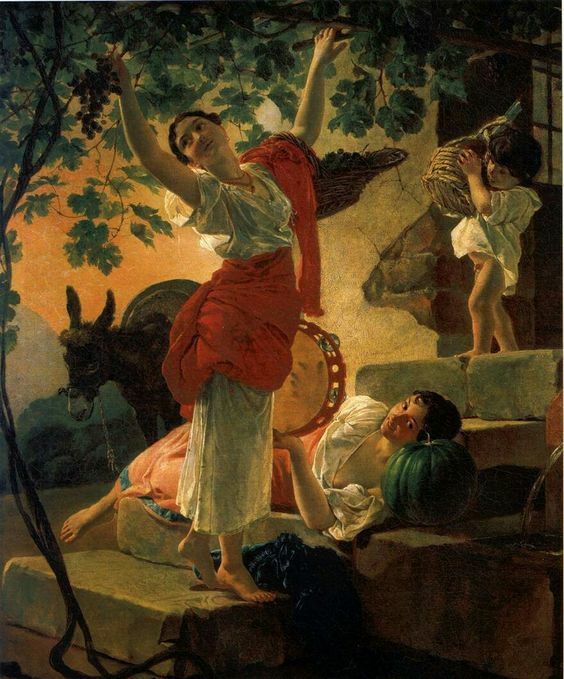 While teaching at the Academy (1836 -1848) Bryullov continued his own artistic efforts, but was unable to produce a work comparable to his opus magnum. He was expected to create more monu-mental, large historical paintings, but none of such works went beyond the sketching stage. None of the subjects he tried to paint – the Siege of Pskov by the Polish King Stefan Batory, the Invasion of Rome by Henserix and the Napoleonic War of 1812 – inspired him as Pompeii had. The only large-scale paintings that he completed were altarpieces for the Kazan Cathedral and the Lutheran Church of SS Peter and Paul in St. Petersburg. He painted mostly portraits, which he produced in great quantity and to a consistently high stan-dard. Among the best psychological portraits of this period are those of dramatist Nestor Kukolnic, Count Perovsky and his nephew, the future poet and playwright Aleksey K. Tolstoy, writer Alek-sandr Strugovshchikov and Princess Elizaveta Saltykova. 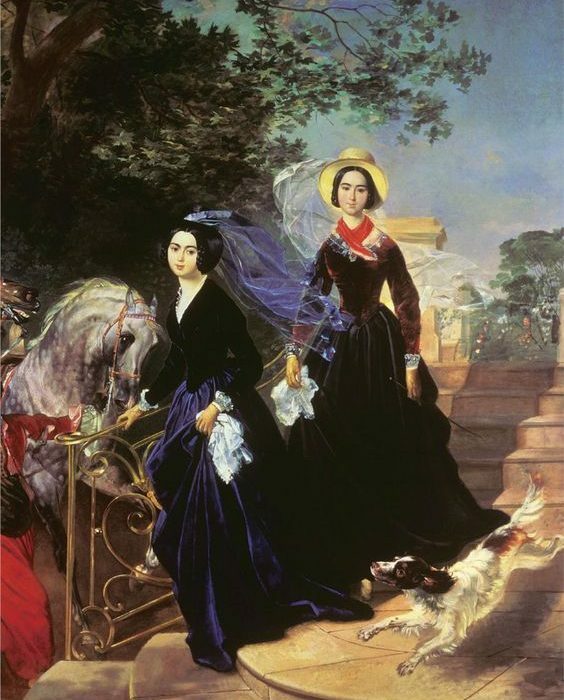 Unrivalled in his portrayal of large parade portraits, he painted the social and political elite of the Russian aristocracy, including Grand Duch-ess Elena Pavlovna and even Emperor Nicholas I and Empress Alexandra. His portrait style of the period combined a classical simplicity with a romantic trend and his penchant for realism was satis-fied with an intriguing level of psychological penetration providing an insight into the very epoch and its people. By the late 1840s, Bryullov’s health deteriorated due to his unrestrained lifestyle, unhappy marriage and his hard work on frescoes in St. Isaac’s Cathedral in St. Petersburg, which he was unable to fin-ish. Following his doctors’ advice, in 1849 Bryullov left Russia for Madeira in the hopes that a warmer climate would help his recovery. He visited Germany and England and then spent a year in Madeira and his health seemed to genuinely improve. His last two years were spent in Rome with the family of Garibaldi’s partisan Angelo Tittoni, with whom he was very close and whose succes-sors have been treasuring the master’s portraits and still-lives, inherited from generation to genera-tion. 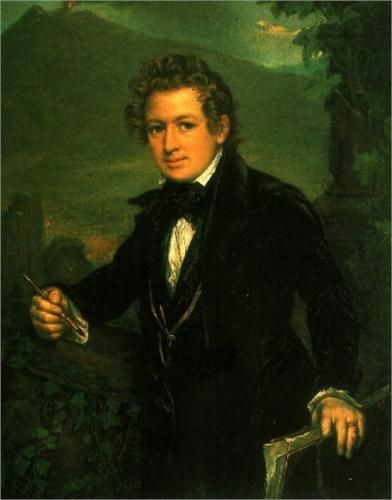 He created several excellent pieces during those years, including portraits of the Tittonis. He died of a stroke in Marsciano, near Rome on 23 June 1852 and was buried at the Cemeterio Degli Inglesi in Rome. The artist’s gravestone is adorned with an imprint of the Neva and Tiber rivers as symbols of Russia and Italy with Bryullov’s profile in between them. A victor, a romantic personality and an irresistible celebrity, Bryullov was described by contempo-raries as “a shortish man with plump little hands, delicate little legs and an antique head as beautiful as that of Apollo of Belvedere, his high lion’s forehead is crowned with free golden curls, the eyes radiate inspiration, wit, genius, and thought.” That was how Bryullov painted himself in many self-portraits and he was portrayed similarly by other artists. Experts believe that the Bryullov phenomenon was a landmark in the history of Russian and West-ern European relationships in fine arts. He was the first Russian artist of pan-European dimensions possessing a mastership that amazed contemporaries. 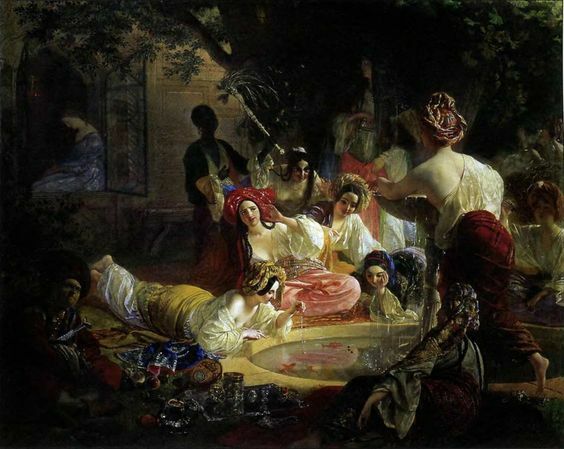 In the first half of the 19th century Karl Bryullov was seen as a perfect romanticist in temper and disposition, even though of a somewhat different nature than those of contemporaries such as Gericault or Delacroix; later, ideals changed and he was labeled an academic. But no matter the epoch, Bryullov has consistently been praised as an outstanding master.